(CNN) – Call it a new twist on an old favorite. Former House Speaker Newt Gingrich announced plans for a new 21st Century Contract with America during an event in Council Bluffs, Iowa late Monday. According to the Des Moines Register, Gingrich described the revamped proposal as "very visionary" and "10 times deeper and more comprehensive than 1994." The GOP presidential hopeful who's been polling in the low single digits of support said his ideas are "exactly what Abraham Lincoln would have campaigned on." The original "Contract with America" spearheaded the successful Republican effort to win back a majority in the House of Representatives in 1994, while the White House was occupied by President Bill Clinton, a Democrat. 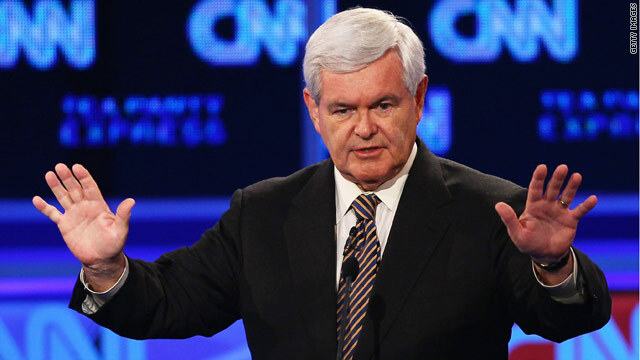 And though the partisan scuffles made headlines and eventually led to a government shutdown, Gingrich credited Clinton with wanting "to accomplish something bigger." Admitting that "the truth is, while we changed the system some … we didn't fundamentally change the underlying system," Gingrich pledged the new contract will make good on its promises. Gingrich spokesman Joe DeSantis confirmed the candidate will unveil the new "21st Century Contract for America" September 29 in Des Moines, capital of the critical first-in-the-nation primary state. My mother taught me that it is impolite to laugh at your own jokes. Apparently, Mr. Gingrich did not get the message. N ewt Gingrich is a self serving man. He cannot be our President. He has been unfaithful to his wife and also has tax proplems. Who else but a slick politician would form a non-profit organization to solicit campaign funding and then use the solicited money for campaign expenses. Nothing but a slick and crooker politician would have thought pof this. It's played out, Newtered. Keep your Contract on America and shove it. Republicans still listen to a man with a proven record of imoral and unethical behavior! FOLKS, HE WAS POKING A STAFFER WHILE HIS WIFE FOUGHT CANCER! HE DID IT WHILE LEADING THE CHARGE AGAINST BILL CLINTON! HELLO! What does it take for a Republican to be too dishonorable to run for office?